Clockwise from top left: Pink Lady Roll, Sashimi, Edamame, Nigiri, Shrimp Tempura Roll, Seaweed Salad, Maki. If you’ve never had a chance to try excellent quality sushi, my heart goes out to you. Misconceptions abound; sushi lovers know this Asian cuisine goes well beyond raw fish. With that said, cast off what you think you know about sushi and join me for a walk on a cool, crisp morning along the beach. 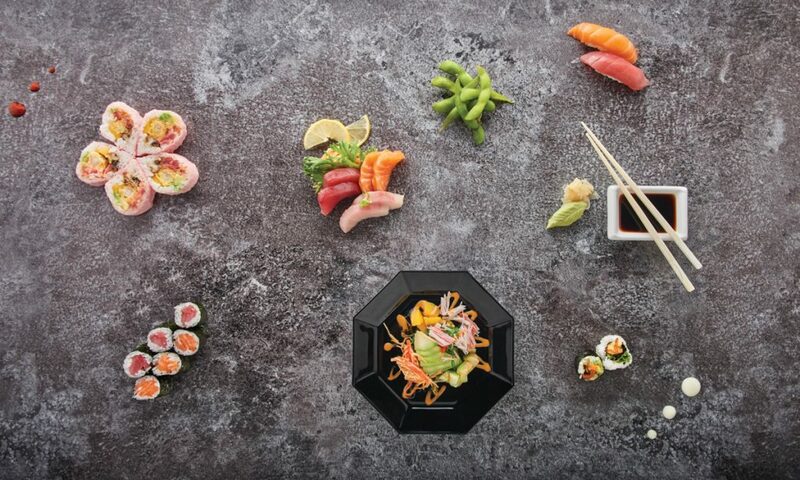 The taste of the ocean’s sweet spray is entirely reminiscent of the refreshing quality sushi should represent. Anytime I mention the word “sushi” to those unfamiliar with good sushi, they will often turn tail and run. If their preconceptions or experiences include sushi with a fishy smell, their stance is arguably justified – being served malodorous fish is among the worst possible food experiences there is. But the course is worth reversing, if you’re game to pursue one of the most satisfying and misunderstood delights in this world. 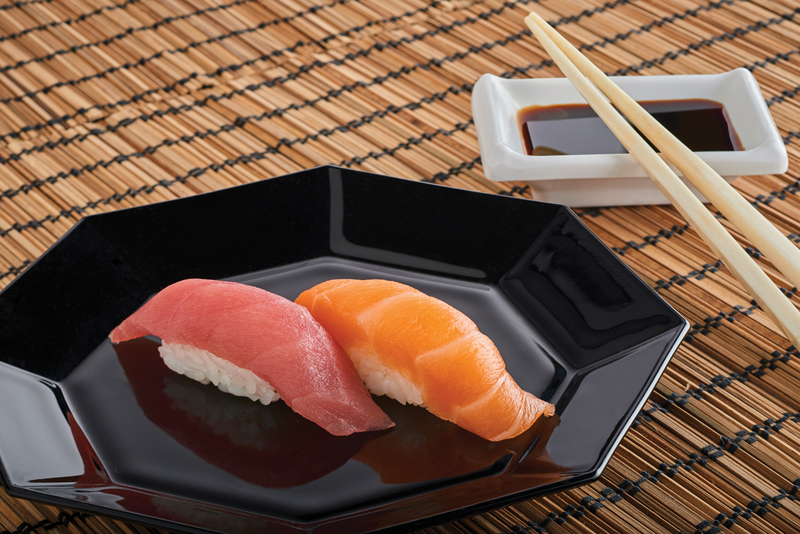 Sushi is more than just a style of cooking, and it’s more than raw fish. It’s comfort food that can also be cooked, and once understood, it easily becomes an addiction. The title of this month’s Foodographer could be “Sit at the bar!” because if there’s one helpful message I can impart upon you, that’s it. Whether sushi is as unfamiliar to you as rush-hour traffic on the planet Mars or you eat it three times a week, which is my current record, take a seat at the bar. It’s the best seat in the house for as many reasons as octopi have arms. Watching intently, one observes the craftsmanship and culinary skill of the chef. It’s visual poetry, considering the presentation of vibrant colors, the perfection of flavors, temperatures and textures as they come together on a plate. The quality of your food is critical, but your experience is equally so and reflects upon your meal. 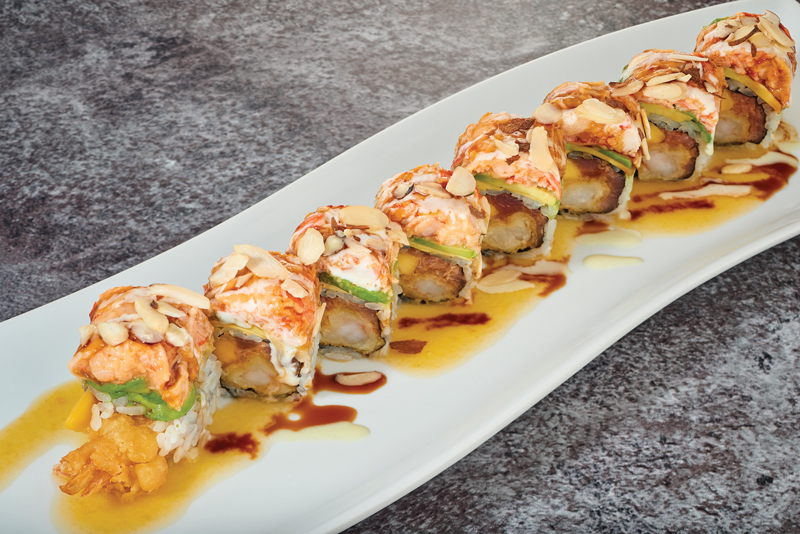 Tsunami Roll made with shrimp tempura, mango, spicy tuna, topped with avocado, crawfish salad, mango sauce, eel sauce, wasabi sauce, fish roe and shredded almond. If you’re a greenhorn, your proximity to the chef while sitting at the bar is an obvious advantage. Inquiring of various dishes as they come together will help you learn and determine your preferences. You’ll learn throughout your meal (and even before ordering), plus watching chefs work is enthralling. You’ll see firsthand how much care intentionally goes into crafting each bite. It’s a rich social and interactive experience – talking with folks nearby is similar to dining at a lunch counter. I’d also suggest that you bring a friend along with you who knows the food, or better yet, the menu you are ordering from so it’s not as overwhelming. You’ll feel safer asking questions and trying new dishes, plus you will have a better chance of discovering something you love. It can take time to uncover what makes your heart happy and your belly full. Even if you’re a seasoned culinary seafarer, the reasons for sitting at the bar remain as valid. As your palate develops, asking what the “best” cuts are that particular day is a fantastic bonus. Sushi menus change even when they’re the same on paper, as not all fish are created equal. For instance, there may be rare or highly sought-after cuts of fish swimming around. Toro, or tuna belly, for instance, has a higher fat content, thus offering a creamier mouthfeel that plays well with citrus. Omakase is a wonder along those lines. Translated from Japanese as “chef’s choice,” it not only takes advantage of their creative desires but also the best ingredients of the day. Moreover, you’ll build a relationship with the chef over time, and she or he will learn your preferences. And, that’s at the heart of food as a whole: the relationship between the diner and chef is underrated. While I’m usually up for trying something new, I’m fiercely loyal to one sushi restaurant, Tsunami Express in Lancaster. Or, rather, I’m loyal to its chefs, Kar Lee and his nephew, Frankie Lee. Kar was the inaugural chef at Blue Pacific, and he takes pride in having introduced Lancaster to sushi in 2001. The former owner of Tsunami on Columbia Avenue, he returned to Lancaster after cooking in Australia and opening a poke restaurant in Philly’s Chinatown (with Andrew Hu, whose family owned Blue Pacific). 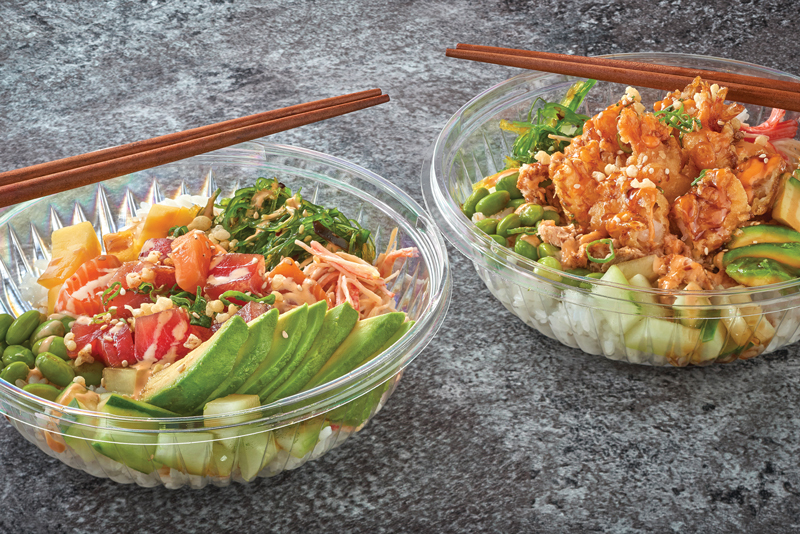 Poke bowls, or Hawaiian-style sushi bowls. On the left, the Tsunami Bowl (raw) made with tuna, salmon, spicy kani, mango, avocado, cucumber, edamame, scallion, tempura crisp, fish roe, ginger soy dressing and spicy aioli. On the right, the Teriyaki Bowl (cooked) made with shrimp tempura, broiled salmon, spicy kani, avocado, cucumber, edamame, scallion, tempura crisp, spicy aioli sauce and teriyaki sauce. When he returned to Lancaster to open Tsunami Express, Kar brought Frankie on as a partner. In their absence, I perhaps had sushi five times in as many years; it was never as good as when Kar prepared it. Hail Poseidon, my current record is at three visits in a week. Today, I consider Kar and Frankie as friends who happen to be on the other side of the sushi counter. When I walk into Tsunami Express, if I were to only ask for my usual order, I can’t tell you how many of my preferences would be matched without another word. “You got it!” is Kar’s go-to line. Other friends who’ve offered to order food for me at Tsunami Express only need to mention my name without even discussing the menu. Nigiri made with rice, tuna and salmon, and a side of soy sauce. The Lees know exactly what to do: either nigiri, tuna or salmon rolls wrapped in pink soy paper rolls in lieu of nori or dry seaweed (it’s a texture thing), an insanely satisfying special seaweed salad and, of course, chopsticks. Their sushi is divine, but that personal connection takes it to an otherwise unachievable level. There are many days I end up grabbing a bite to eat alone, and it’s nice to sit by the counter and chat. The way in which food connects us can be deeply personal, and that is especially true for sushi. Culinary skill, artistry, personality and care are apparent in every meal. In Tokyo, Japan, where sushi reigns supreme, 93-year-old Jiro Ono is world renowned for his mastery of the craft. While shirking the notion of having arrived, Jiro’s level of care is astounding. He observes diners as they eat, catering each piece of sushi to fit their hands and mouth, served at precisely controlled temperatures that evoke the perfect flavors from his fish. 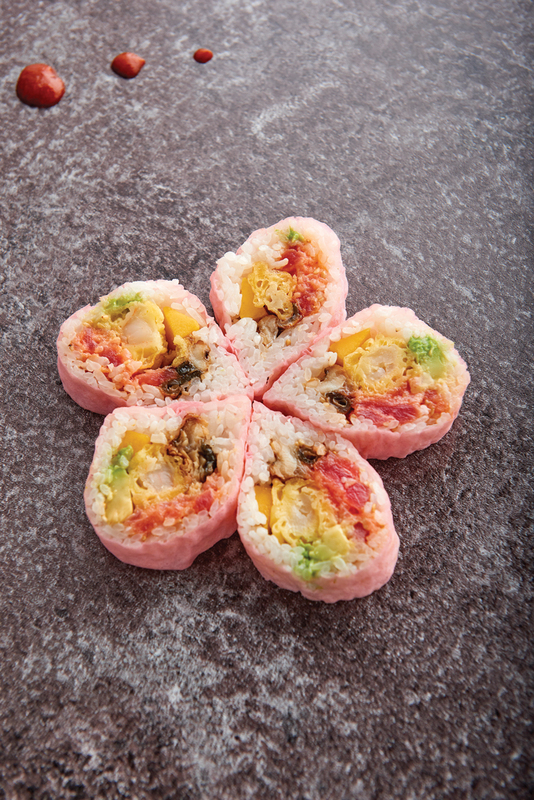 Pink Lady roll consisting of shrimp tempura, spicy tuna, avocado, eel cucumber, mango wrapped in soy paper. We must all grow to become better/improved versions of our prior selves. Life is too short for us not to keep it interesting and meaningful. You don’t have to like everything, but it’s worth taking a chance. Selfishly, I hope Kar and Frankie are still making sushi at that age. There is joy in introducing new things to friends, and food is certainly one of them. Seeing others enjoy something otherwise undiscovered to their world is remarkably satisfying and fulfilling. Food finds yet another way to exist as a vehicle for shared experiences and emotions. Your life finds added fulfillment with each new discovery. Overcoming fear to take a chance at something new will almost certainly yield rich rewards. Sashimi consisting of yellowtail, salmon and tuna with a side of crab and soy sauce. Tune into NatGeo, and you’ll see for yourself how lucrative fishing for bluefin tuna has become due in part to the popularity of sushi. Two shows – Wicked Tuna (Massachusetts) and Wicked Tuna: Outer Banks – follow the fleet as they battle currents, weather, size limits and quotas to land tuna. The prices paid for the fish are mind-boggling. Even more amazing is the fact that as fast as the fish are unloaded and deals are struck, they are destined for markets and restaurants all over the country and even the world. Earlier this year, a record $3.1 million USD was paid for a 613-pound bluefin tuna by restaurant chain owner Kiyoshi Kimura. 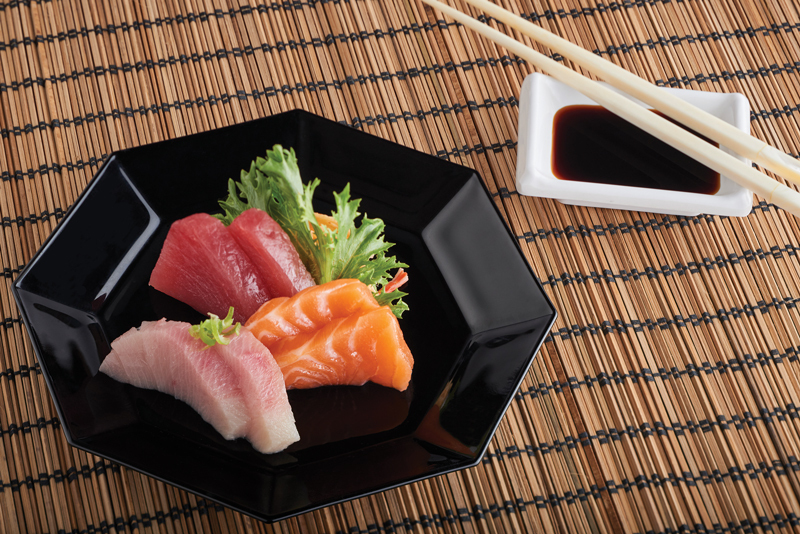 True to Asian dining, you can share and sample sushi in order to try more things than if you were sailing solo. Don’t let the ingredients scare you away. Some sushi is served cooked, fried (tempura), and of course, raw. Ingredients on the “safer” end of the spectrum include tuna, shrimp, crab, flounder, tofu, snapper, mackerel, yellowtail and salmon, and range to the more exotic selections like fish roe, uni, octopus and eel. Unlike saltwater fish, salmon is frozen at designated periods of time and temperatures in order to kill potential parasites and ensure safe eating. While fish is the star of sushi, rice is debatably the first and most important ingredient. Also known as sumeshi, vinegar sushi rice is made with salt, sugar and vinegar. Its consistency is sticky and tender, hence it’s commonly referred to as “sticky rice.” Most sushi chefs begin their careers focusing on rice before getting to fish. It can easily be appreciated in chirashi or Poke bowls of rice adorned with colorful cuts of sashimi. Eat sushi pieces individually one at a time. Dip the fish in soy sauce, never pouring the soy sauce onto the sushi or soaking rice with it, which masks the flavor of the rice. Ginger is a palate cleanser, so don’t top your sushi with it. Rubbing chopsticks together is considered rude, implying the chef can’t afford quality chopsticks. 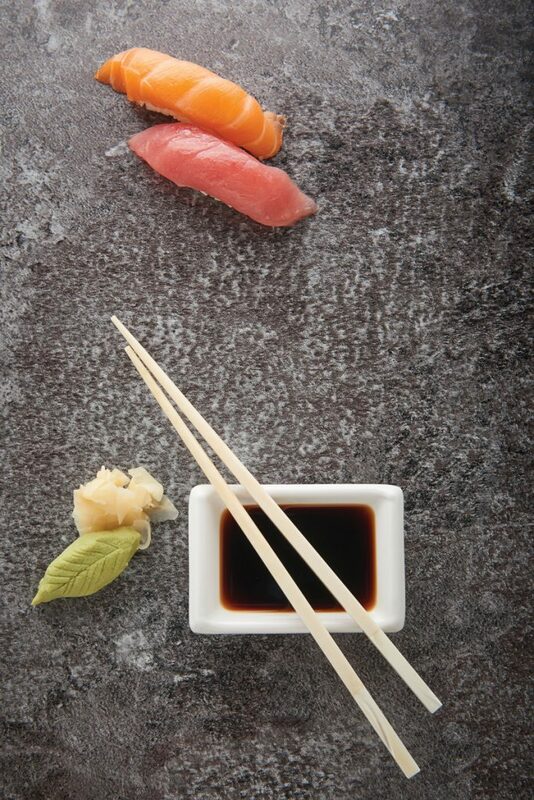 If you’re not comfortable with chopsticks, order nigiri and use your hands. If anything, you’ll look more authentic. Actually, nigiri can and should be eaten with your hands, upside down so the meat touches your tongue first, highlighting the texture, flavor and freshness.